Q: I am about to rent an apartment in New York. The lease says that the agreement will be “governed, treated, and interpreted” according to the laws of New Jersey. Why is the landlord doing this? Is it legal? –Keith F. A: Your landlord has inserted what’s known as a “choice of laws” provision in your lease. I’ll bet that the landlord lives in New Jersey, has a New Jersey lawyer, and would prefer that New Jersey law be applied in any dispute, simply because he and the lawyer are familiar with it. They may also think that New Jersey’s landlord-tenant laws are more favorable to landlords than those of New York, so applying them will give the landlord an advantage. Courtesy of an age-old doctrine from England, courts will apply the literal “law of the land” to a dispute concerning the ownership of real property, including disputes about leases. A little thought will show you why: If litigants could specify that a lawsuit over land be decided according to any set of laws they might choose, you’d quickly end up with chaotic and inconsistent decisions concerning each parcel. Imagine, for example, a lawsuit concerning title to land in Arizona, decided according to California laws, and then challenged by later owners, but this time according to Nevada laws. But wait, there’s more. If this ploy could succeed, we’d expect many leases to provide that they will be interpreted according to the laws of … well, I hate to say it, but Arkansas takes the prize. It is the sole state in the union that does not require landlords to offer and maintain fit and habitable rentals (until recently, Alabama and Colorado also shared that dubious distinction). That’s not to say that choice of laws provisions are always tossed out. 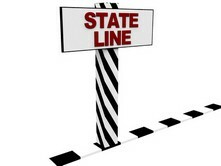 When the parties to a contract that doesn’t involve real property negotiate at “arm’s length” (as coequal businesspersons), and when the choice of laws designation will not offend the public policy of the state that’s asked to apply a sister state’s laws, a choice of laws clause is often upheld. But you can see right away how this lease clause fails both these tests, too. First, most judges realize that residential tenants and landlords as parties do not negotiate at arm’s length. Though there are exceptions, to be sure, most of the time the tenant is relatively unsophisticated, dealing with an owner or management company whose business is to rent residential property. In addition, courts recognize that housing is a necessity, which often means that tenants cannot reasonably walk away from a “take it or leave it” lease. In tight markets especially, judges know that even well-informed tenants often have no real bargaining power. Second, and more importantly, judges won’t apply a sister state’s laws if doing so would be against the public policy of their own state. You can imagine what a New York judge would say about disregarding New York law and depriving a New York resident of the benefit of its tenant protections. To take an extreme example, if the rental is under rent stabilization or rent control, there’s no way a New York judge will agree to bypass those laws and apply another state’s law. I’d have a conversation with the landlord and point out that this attempt is likely to fail. If you get nowhere, consider looking for another rental. Though you’d probably prevail in any court action in which the landlord attempted to get the judge to apply New Jersey law, you’ll spend time and expense doing so. And even before getting to court, this attempted end-run will get in the way of your attempts to settle the dispute, because you’ll first have to agree on whose law to apply — and if there’s no agreement on that score, you won’t get beyond it. Finally, it’s not a good omen — you’ll be better off if you choose a landlord who manages his property in a more straightforward manner.